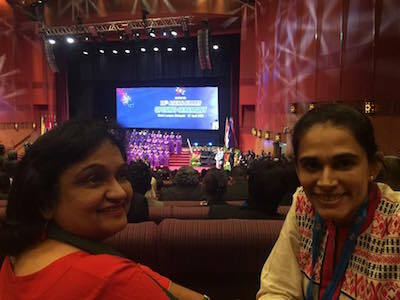 Prof Kiranjit Kaur and lawyer Gurmeet Kaur were seen at opening session of the 26th Asean Summit in Kuala Lumpur, yesterday. Prime Minister of Malaysia Mohd Najib Razak had addressed the session. Malaysia is the current chair of the Association of Southeast Asian Nations. They attended under the banner of National Council of Women’s Organisations Malaysia (NCWO). Dr Kiran is the Professor in Public Relations at Universiti Teknologi MARA (UiTM) and a founding member of Sikh Women’s Awareness Network (SWAN). Gurmeet is a lawyer with a global oil and gas company. READERS: If you are at an event with some other fellow Sikh, capture the moment and email it to us at: asia.samachar@outlook.com. Do provide us details and a contact number. Kiran has done a lot of good work in community development, not only for the Sikhs but also for the overall Malaysian community in various capacities. Gurmeet is doing her bit as well, especially in good practices for holistic development of the young.